✓ Mix: garlic, onion, 4 avocados, cilantro, lime juice & jalepeno until smooth. ✓ Then fold in 2 avocados cubed to make chunky. ✓ If you are serving right away fold in diced tomatoes & serve. ✓ If keeping overnight add tomatoes before serving. ✓ Cover the guacamastro by laying celophane directly on top of the mixture so that no air touches it in the fridge. ✓ THIS RECIPE IS “OFF THE HOOK” AS MANY HAVE EXPRESSED. SO GET READY TO IMPRESS YOUR FAMILY AND FRIENDS, AND REMEMBER TO BE MODEST, I KNOW IT WILL BE DIFFICULT, BUT TRY. 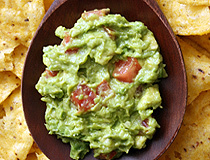 ✓ This increasingly popular dip is made from avocados and is originally from Mexico. A close cousin from Florida is larger but not as tasty, so use the smaller ones from Mexico. The trick to perfect guacamole is using good, ripe avocados. Check for ripeness by gently pressing your thumb in the avocado. If there is no give, the avocado is not ripe yet and will not express its peak flavor. If there is a little give, but still firm the avocado is ripe. If there is a lot of give, the avocado may be past ripe and I would not recommend using that one. ✓ Safety tip: Be careful handling the peppers; wash your hands thoroughly and do not touch your eyes or face with your hands for several hours. Rub your eyes and you’ll never do it again! Don’t even touch your face; it will burn for quite some time! If you do, the only thing that stops the burn is milk, wash your face with it and all will be good.